From brilliant rays of sunlight to fresh flowing clean air, skylights give consumers a new way of renovating their home and business. Skylights are also infamously known by the building industry as the one product that causes a nightmare of a repair job. But, do they really? When considering adding a skylight to your project, there are a couple of misconceptions floating around that you should be aware of—particularly when working with VELUX skylights. Since the beginning of time, you couldn't say the word "skylight" without the word "leak" somewhere in the sentence. And unfortunately, the notion that skylights leak is still heavily talked about in the industry. At one time, old bubble dome skylights were prone to leaks. Without proper water protection, water was able to easily seep into the house through the flashing. And because of the massive repair bills and clean-ups needed to fix the leaking skylight, people remain leery of installing a skylight. Yes, old skylights leaked. But hear me out. VELUX Skylights do not. Plus, our skylights come with a 10-year installation warranty, 20-year glass warranty, 10-year product warranty, and 5-year warranty on blinds and controls. So, on the very rare chance something happens, there's a warranty. Storms can quickly turn nasty, causing all sorts of damage to surrounding vegetation and buildings. One of the warnings many roofers give out is that having a skylight on your roof is dangerous, especially in high storm areas because they'll break. So, let's confront the most common weather element that many believe break skylights: Hail. Our sister company in Australia decided to put a VELUX skylight under the gun (literally) and fire hail stones at the skylight's weakest points. If VELUX skylights can survive the weather in Australia...well, let's just say they can survive anywhere. But, if hail does damage a VELUX skylight, VELUX offers a hail warranty on skylights with Clean, Quiet, and Safe glass. Skylights contribute to a lot of free light throughout the house, even in harder-to-reach areas where vertical windows won't fit. All great and wonderful for saving on electric bills...unless of course, all that heat and air go right through the skylight. Understanding the energy performance ratings of skylights is important in picking the right application for your area. VELUX skylights hold the energy-efficient label of ENERGY STAR®. And between our Low-E glass and light filtering blinds, VELUX skylights can help reduce the heat coming or leaving a home. You can view more of our testing data here. Leave furniture in the light long enough and it will start to fade from the sun. Or, sit under the sun too long and you'll get overheated. Or, you'll get a glare from the sun. Or, the sun will cause the space to get too hot. So to avoid all that, don't install a skylight. Alright, we get that. 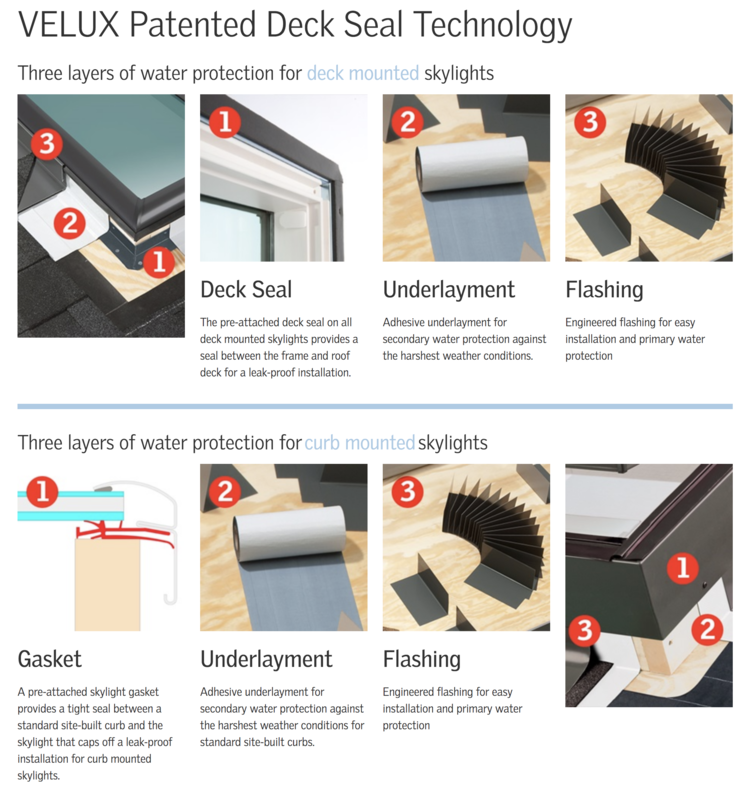 So we created VELUX skylights that block out 95% to 99% of UV rays. And with a wide selection of blinds to choose from—blackout to light filtering—customers can decide when and how much of the light to let in. The notion that skylights contribute to overexposure just doesn't ring true anymore in newer skylights. Just like any renovations to a home, adding skylights aren't expense-free. But because some of VELUX skylights contribute to decreasing energy dependency by using solar energy, a 30% tax credit could apply to both the product and installation. In some cases, the skylight is free. For you as a contractor though, skylights are a quick way to make an extra profit without your customer having to spend too much money. Save time and money by adding in a skylight anytime you go to reroof a house. And be sure to check out our VELUX Solar-Powered "Fresh Air" Skylight and the VELUX Energy Performance Model skylights for that 30% tax credit. So, sure, skylights in the old days had their problems. But is it too much to ask for us to get a second-chance? When you choose VELUX skylights, you won't be disappointed in the quality and reliability of the product. Promise!